Trip Report #25 – More Battle Mountain, Is Tonopah The Next Ghost? This world championship speed event held in Battle Mountain each year features fully enclosed bikes and riders from around the world. No sooner did Battle Mountain bring off its hugely successful “Old Spice Festival in the Pit” than its citizens took a deep breath and began setting up for the 2003 World Human Powered Speed Challenge. Last year Sam Whittingham of the UK broke the world speed record for the third year in a row by pedaling 81 mph, this year he crashed at 80 mph — and walked away to tell about it. The Evie team set a new European record, and the Battle Mountain dateline made another little blip on world consciousness. And just when you’d think they’d sit down and chill out, they held the 2nd Annual Chukar Tournament & Feed on November 8. Last year’s 135 participants brought in 194 birds, and many of them are signed up for this year’s event. For more information e-mail Rogene at the Civic Center or call 775-635-1112. 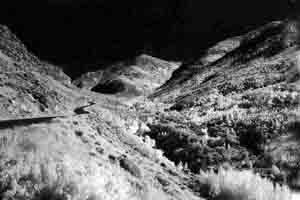 By the way, as Battle Mountain celebrates its victory over adversity and gets moved up on everyone’s ‘must visit’ list, there’s a wisp of black shadow seen with the edge of the eye, a forgotten figure amidst all the fun: Lorrie Baumann. When the first full shock of the Armpit award struck Battle Mountain, she was fired from her job as editor of the local paper. Here is the offending passage from Gene Weingarten’s article in the Washington Post Magazine. If Gene can now be honored at the great celebration he fathered with his article, shouldn’t Lorrie be waving from a float in the big parade too? If she hadn’t confirmed his instinctive grasp of the situation, would he have held firm in his choice? Or would Rock Springs Wyoming have pulled it out at the last minute? 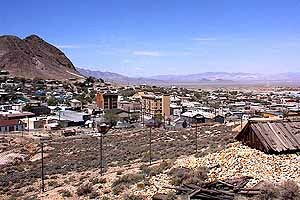 Tonopah was Nevada’s first 20th century city, hugely influential in Nevada’s history from 1900 until World War II. straightforward integrity, and she was sacrificed to the outraged mob before anyone (except Gene) realized it was no ordinary baby, but the Golden Goose. Lately she was living in Winnemucca and writing a book, but she wasn’t at the festival. 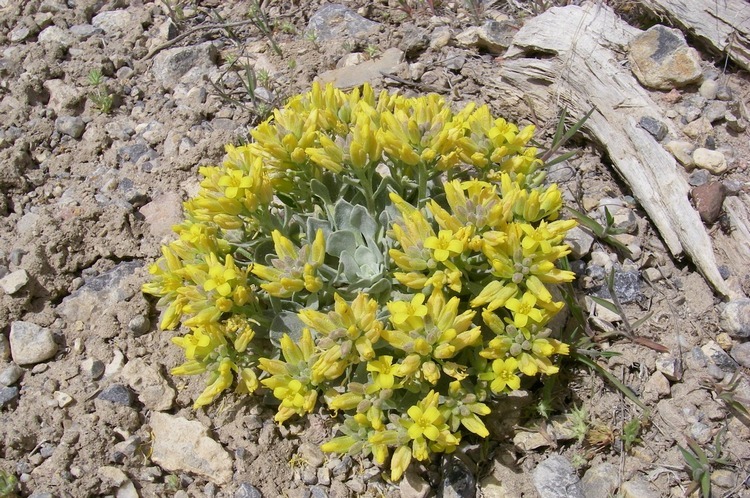 Is Tonopah dying? The landmark Mizpah Hotel at the city center is again in bankruptcy, padlocked and dark. There has been interest in the old beauty, but no-one has brought the $1.5 mil into view. The Silver Queen restaurant, and the marvelous Jetsons-style motel office next to it, have been smashed flat and scraped off the face of the earth. The L&L Motel, is now in the middle stages of decay after being closed for several years, a pink ruin, very offensive to the eye. Someone has announced plans for a Howard Hughes Wedding Chapel & Museum to capitalize on the magic moment when the Hollywood wonderboy and madman-to-be married movie star Jean Peters. 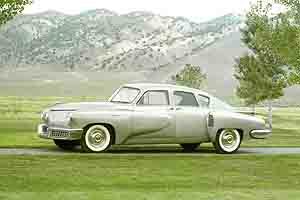 The 1948 Tucker was a car ahead of its time with a rear engine, automatic transmission, disc brakes, independent suspension and many advanced safety features including a padded dash, pop-out windshield and armored passenger compartment. This one belongs to the National Automobile Museum in Reno. People traveling on US 95 get tired, they have to rest, but they’re afraid to pull out into the sagebrush (probably the safest place in America), so they get a motel room. Tonopah is great for visitors — Jim Marsh bought the hotel at the top of town and named it Tonopah Station. It’s thriving again, and there is a handful of other good motels, the Jim Butler and the Best Western High Desert Inn in particular. The budget-priced Clown Motel toward the bottom end of town is the newest motel in the city. The Mexican restaurant El Marques, and Cisco’s down the hill, managing to sustain themselves on the highway traffic, but the rest of the businesses are on short rations. For a while the folks at the Gas N Go had developed a little fastfood business in the minimart — they made killer chocolate malts, take you right back to 1956 — but they bailed. Everybody’s terrified that the Scolari’s will close. The thriving little city of Pahrump, far to the south, wants the county seat. So if ever you’ve wanted to see an authentic ghost town in the making, visit Tonopah. Gas is $1.89 at each end of town, only $1.59 downtown, but how? 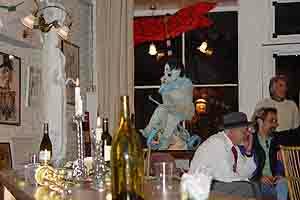 Welcome Grant, a fine art gallery, brings a cosmopolitan touch to Virginia City’s C Street. The current exhibit features original artwork from some famous Grateful Dead album covers and posters never before shown. Also Mark Yamagata puppets, signed posters from the Age of Psychedelia. and Edweirdo Martinez works on paper. , actually supporting himself with the flimsy plastic marker sign, looking as if a gust of wind would bowl him over, and send him blowing across the sagebrush like a tumbleweed. He was going to Hawthorne. As I helped him into the car I saw he had stuffed his chapped and swollen feet into a pair of bedroom slippers. Was he 70 years old? 80? I don’t know. His voice-box had been rubbed smooth by decades of Pall Malls and alcohol and he didn’t have a lot of energy to push air through it anyway, so I couldn’t understand most of what he said. Off we went, and he mumbled quietly about this and that. “I’ve got four pockets in these pants, and $400 worth of gold coins in each pocket”, he said. He showed me a roll of gold coins and offered me one for the ride. For a hilarious moment I felt like Melvin Dummar with Howard Hughes. THANK YOU for your advice last month for my drive through the northern part of the state. The Big Creek road over Kingston summit looked a bit too steep for me, so I turned tail and headed back to Austin. However, your advice about the “Success Loop” road around Ely was super; the scenery is terrific and I got some great shots. One spectacular place was the Lamoille Canyon s.e. of Elko. The staff at Sherman Station put me on to it. It looks like a slightly smaller version of Yosemite! Really breathtaking! I left him at the El Capitan, carried his ‘luggage’ through the casino and tucked him into a restaurant booth. He ordered some food, and I went back outside, into the car and back on the road, alone now, no more Howard. I decided I’d done the right thing. He was fragile and weak, but he knew where he was, he knew what he wanted and he could pay his way. And if it turned out he needed more help than a ride and a hand to the restaurant, the folks at the El Cap were well equipped to get it for him — the El Cap has been the community triage center for a couple of generations now. The Cliff House is open again and doing a quiet business. Overlooking Walker Lake at dusk you can almost see the lake getting smaller as you watch. I headed north again, along the chalky cliffs at the foot of Mount Grant and then into the open country just beyond. As I coursed through the darkness at 72.333 mph I saw a beautiful big dog, a boxer maybe, skittering in confusion through the brush, caught in the headlights of the passing cars, lost in the dark immensity of the desert. Was that a glimpse of the apocalyptic future: old men and left-behind animals helpless beside the road, headlights gliding by unheeding, the dried-up lake scarcely visible in the gathering gloom. . . .
Naah, everything’s fine, really. 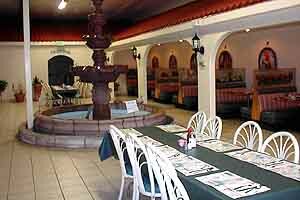 A dinner stop at El Superior in Yerington helps get the world spinning on its axis again. Keeping up with Las Vegas: The Las Vegas Review-Journal reports that there are 82 taverns, bars and miscellaneous drinking establishments that loyally and rabidly cater to fans of specific NFL teams, up from 65 in last year’s count. At last, something for a Ravens fan to do in Las Vegas. Arrangements are well underway for the January Grand Opening of the new Robert N. Broadbent Las Vegas Monorail. Trains will carry highly visible advertising to help defray costs. The route will extend from the MGM Grand north to the Sahara, a 15-minute trip costing $3 one way. And, The Las Vegas phone book is now available online.